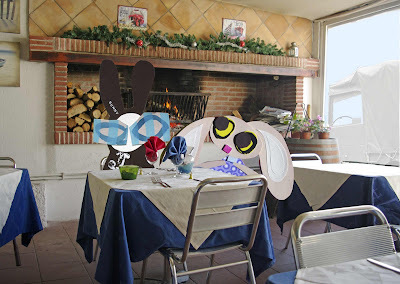 The Wabbit and Lapinette met at La Rivetta, Lapinette's most favouritist restaurant in all of Fregene. The Wabbit insisted on sitting next to the fire to warm his fur and he was eager to discuss their most recent adventure. "What kind of adventure was that?" said Lapinette with a smile and then she waited. The Wabbit leaned back on his chair and adopted a nonchalant air. "It was a kind of surreal road movie," he said, "which was all about the vehicle." "Too right," said Fuoristrada from outside the window. "You didn't leave much of that balloon," said Lapinette. "He needed a waaahmbulance!" 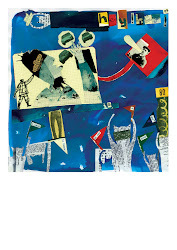 laughed the Wabbit and he made a siren sound. They both laughed and laughed. "What do think they say about me in their Village?" said the Wabbit. "They probably call you "That Wabbit"," said Lapinette. "Oh really?" mused the Wabbit, "how so?" "Well, that's what they call you at the Department," said Lapinette. The Wabbit grinned with all of his 28 teeth. 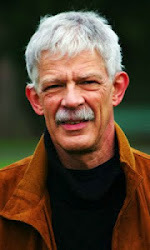 "I'm pleased to be acknowledged," he said, "I expect Fuoristrada's fuel was a legitimate expense." "Do you have all the receipts?" said Lapinette. "Yes indeed," said the Wabbit, "even for the carrot aperitivo." "The Department won't reimburse aperitivi," said Lapinette, "or things you already keep in your fur." "What about the explosive?" asked the Wabbit. "I suggest you don't mention it," said Lapinette, "did you really need all that C4?" "You can never have enough C4," said the Wabbit.